Sanchez, one of Jays’ supplemental picks in the first round of the 2010 draft, was touted as the highest ceiling amongst Toronto’s “Lansing Three” for the Lugnuts in the Midwest League to end the 2012 season. The three has since dispersed and it is unlikely that many lists will still be ranking Sanchez above Syndergaard going into 2014, but Sanchez remains Toronto’s top prospect and there is no question that the reason he was drafted so highly is still fully intact; he has the stuff that aces are made of. Sanchez throws a knee-buckling curve that Trackman places near the top of it’s spin leaderboards thus far in the AFL at 2941 RPM. (ranking him third amongst displayed curves, but their presentation of the data doesn’t allow for any sorting) They also drop in the tidbit that, according to their research, curveballs in the 2700-3000 RPM range tend to correlate with a swinging strike of 13% on the pitch. Assuming he could consistently generate swings on the pitch (it appears that pitchers in his velocity range (79-81) average around a 41% swing rate on the pitch) Given an average swing rate for his curve velocity (and ignoring the excellent separation between his blazing fastball and tight curve) he would expect a 31% whiff rate on the pitch, according to the numbers that Trackman has estimated, and that could climb even higher with the increased swing rate that would come from it being largely an out-pitch for the K-heavy Sanchez. Even given the average swing rate, a 31% whiff rate would easily place him with major-league caliber curves like those of Tim Lincecum, Matt Harvey and Matt Moore. Add in Sanchez’ plus velocity with an average four-seamer coming in at 95.5 MPH this year in the AFL, with a spin rate above the median even for his velocity range, and Sanchez clearly has the weapons at his disposal to strike out batters. And strike out batters is exactly what Sanchez has done. With a K/9 rate of 9.3 in his four seasons in the minors, there is little question about Sanchez’ ability to generate whiffs on either his curve or his fastball. However, as with any top prospect who kicks around for four seasons without reaching AA, there are some serious concerns with Sanchez aside from the pile of Ks he continues to amass beneath him. With a 4.7 BB/9 thus far in his pro-ball career, one could say that Aaron Sanchez has a bit of a problem with the base on balls. This is how a pitcher with the kind of stuff that generates salivating tweets from prospect-hawks the Internet over ends up sliding down the prospect rankings this year. If he can manage to throw strikes consistently, he’s an ace; there seems to be little debate on the upside. He has a whip-fast arm and a delivery that adds a lot of natural deception by hiding the ball a moment longer behind his twisted set-position, but glowing reviews of his mechanics often stop just after the requisite ‘electric arm’ and ‘deceptive delivery’ cliches. As prospect guru Keith Law pointed out recently to much fanfare, Sanchez had been displaying a few bad habits forming as his innings piled up toward the end of his time in the Florida State League. His always-slightly-short-stride reported to be looking even shorter, and Law claimed to see that he was arching his back slightly at release point, which creates an unnatural posture that he also claimed leads to injury. I am no scout but when comparing a couple .gifs I put together below, one from spring training 2012 and one from the Fall Stars game in the AFL last week, it appears that at the very least Sanchez has managed to return his mechanics to roughly where they were nearly two years ago. His stride is short, but it doesn’t appear any shorter. Although the “if it ain’t broke, don’t fix it” argument can’t really be applied in a situation where the pitcher may well be broke. After an up-and-down year in the minors, Sanchez was assigned to the AFL to ostensibly make up for some innings he lost with a minor blister problem earlier in the year. He’s appeared to take a step forward in his stint in the AFL thus far by posting a 0.98 ERA, backed by a strong 8.84 K/9 but he’s continued his troubles with hitting the strike zone to the tune of a 4.42 BB/9. Like any starter with an ERA that starts with a zero, Sanchez has obviously outperformed in that department, but FIP doesn’t hate him either, grading his performance so far this fall as a 3.04. His low ERA is almost directly related to a ridiculously low .122 BABIP, so it’s set to reinflate at a moment’s notice, but the key elements are here for Sanchez to be at least somewhat successful. Even with the walks he strikes out so many guys that his K/BB usually hovers around 2, and the reports from Trackman on his pitches basically rate them as currently major league quality. The problem for the Blue Jays and their fans and for Aaron Sanchez himself is that no one would rather see him become an effectively wild reliever in place of the ace starter he’s meant to be, if only he could figure out how to throw a damn strike. 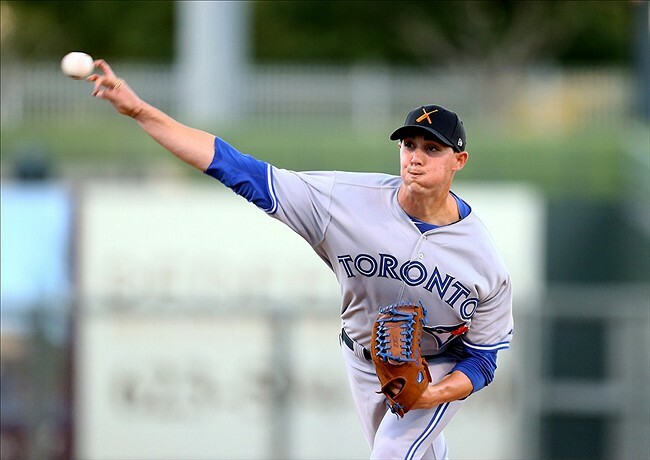 Posted on November 12, 2013, in Arizona Fall League, Blue Jays, Profile, Starting Pitchers, Top Prospects and tagged Aaron Sanchez. Bookmark the permalink. Leave a comment.